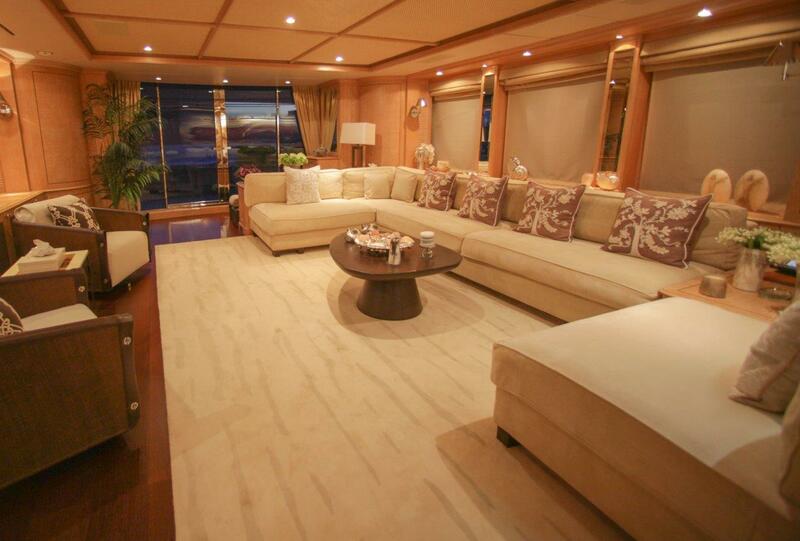 M/Y QUEST R (ex QUEST) is a 2008 36m Benetti luxury motor yacht with interior design by Francois Zuretti. 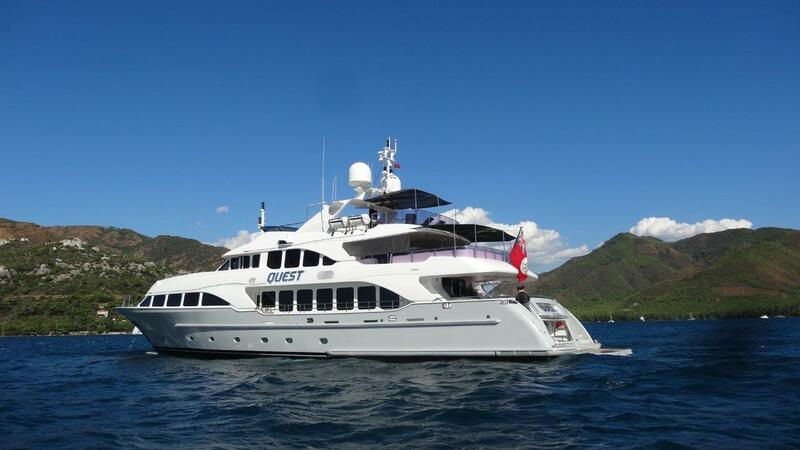 The QUEST R yacht is available for charters in Turkey and the Eastern Mediterranean. 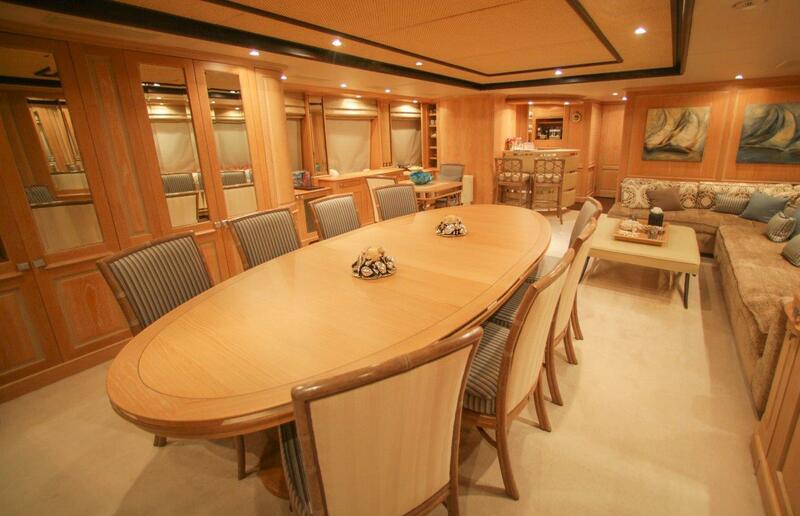 This Benetti QUEST R offers fantastic volume, both inside and out, of her 36m length. She features intelligent functional design and also offers a deck Spa Pool pool as well as a comprehensive selection of water toys. 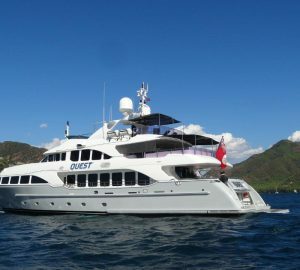 The Benetti yacht QUEST R offers a great platform for luxury charter vacations in your chosen location. 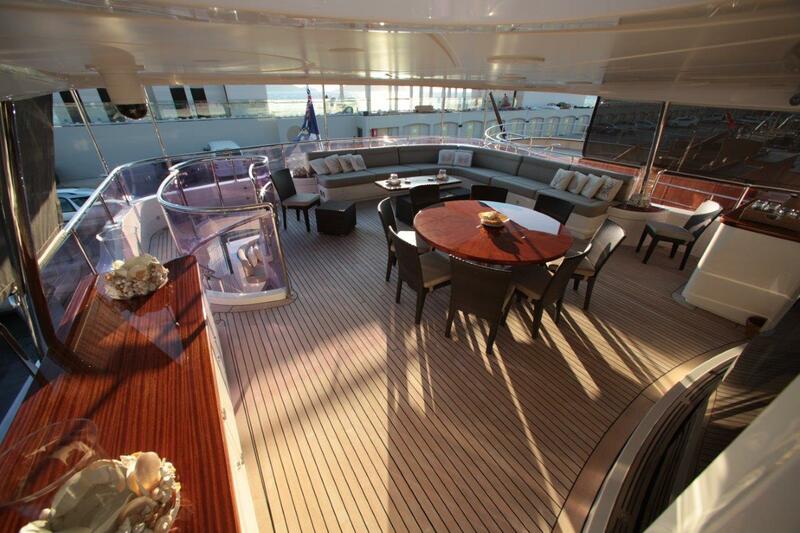 Superyacht QUEST R features an elegant interior by Kate Bingham Interior Designs. There are 2 ample lounge areas. 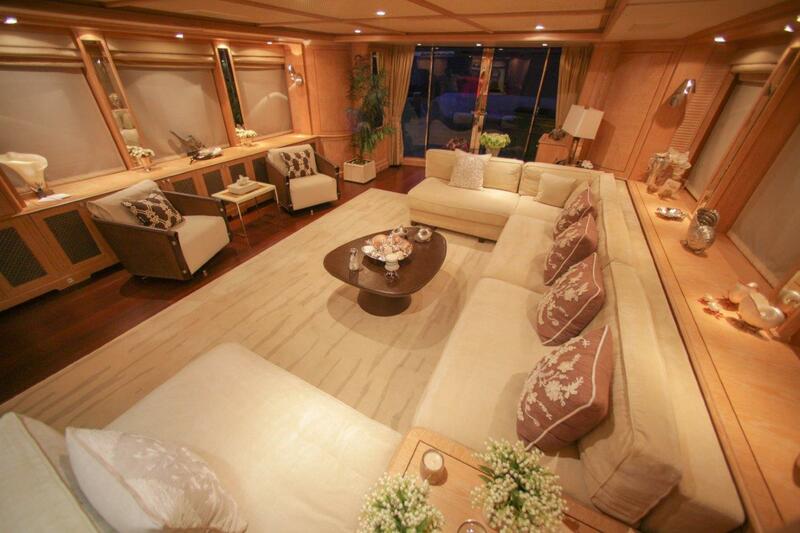 On the main deck, a comfortable salon boasts a large L shaped sofa, coffee table and occasional chairs, perfect for entertaining, with direct access to the shaded aft deck. 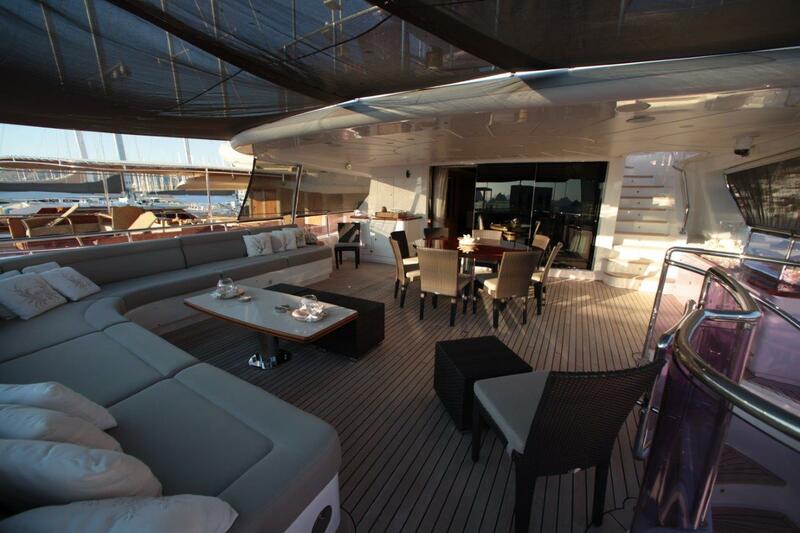 Above, the bridge deck features a further lounge and formal dining tables, with access to the upper aft deck and alfresco dining. 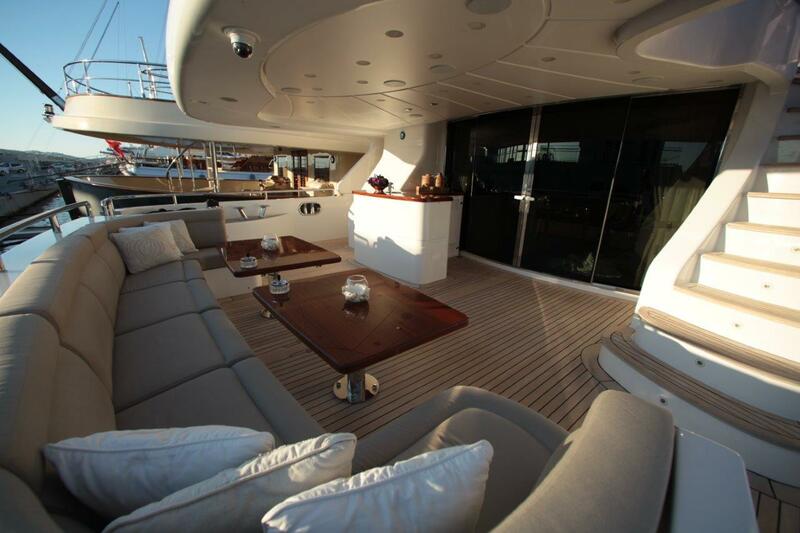 Both decks benefit from panoramic windows, providing ample natural light and fabulous views. 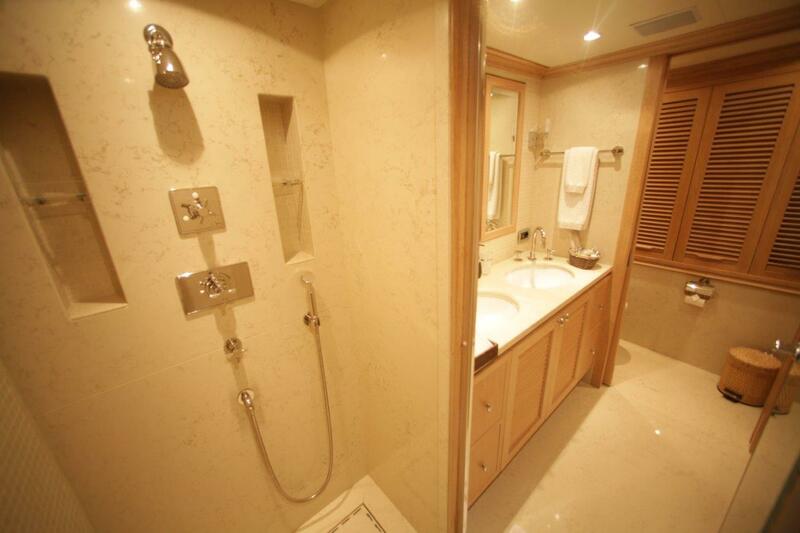 Guest accommodation is in 5 en-suite cabins, a master stateroom on the main deck forward, and 4 guest cabins below decks. 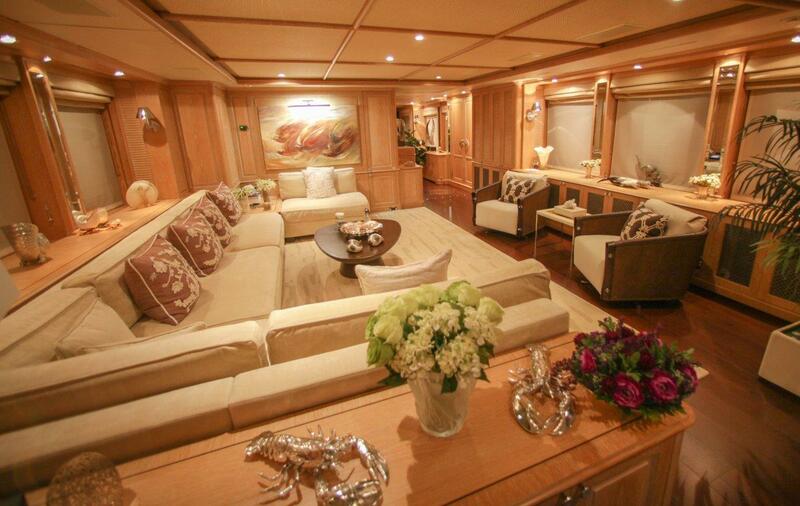 Luxury crewed yacht QUEST R offers a tri deck design and plenty of exterior living. 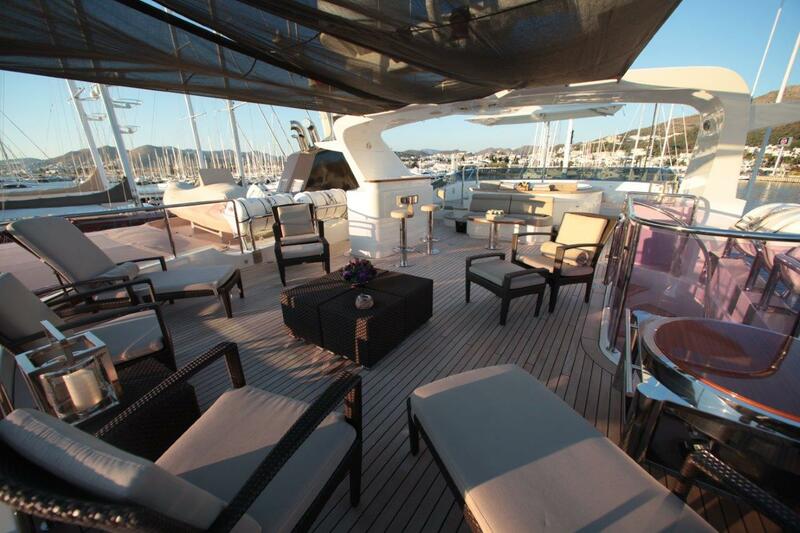 The main deck has a generous shaded aft deck area, with full width seating, cocktail tables and complete wet bar. 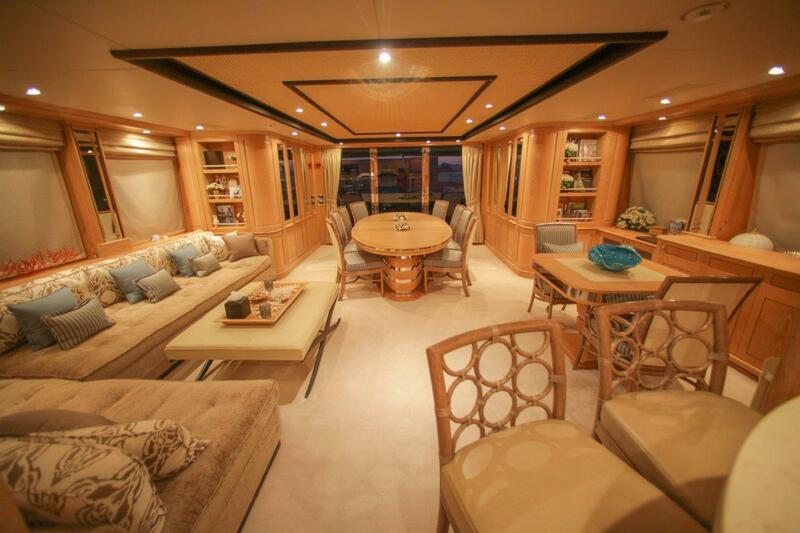 The transom opens to reveal a large water toys garage and ideal teak beach. Above, the upper deck is adjacent to the lounge and dining, boasting an alfresco dining option and exterior lounge seating. 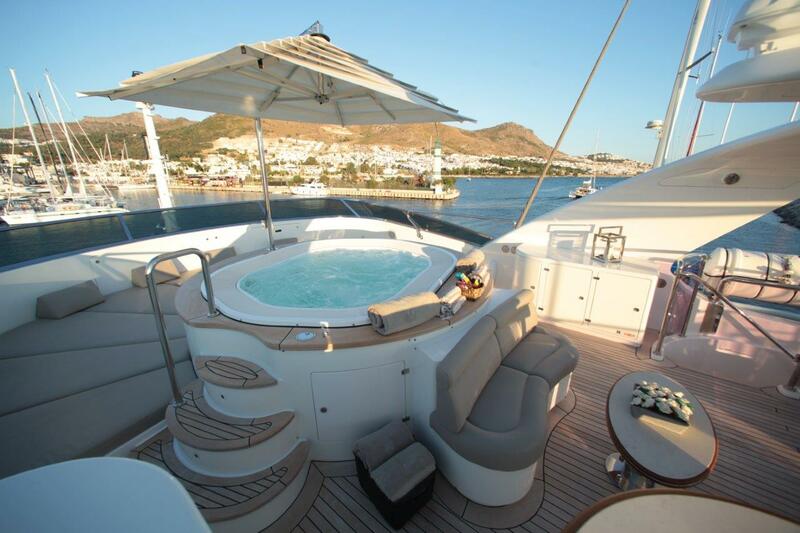 The third deck aboard the motor yacht QUEST R is well-appointed, offering partial shade, chaise lounges, a wet bar and deluxe Spa Pool tub. 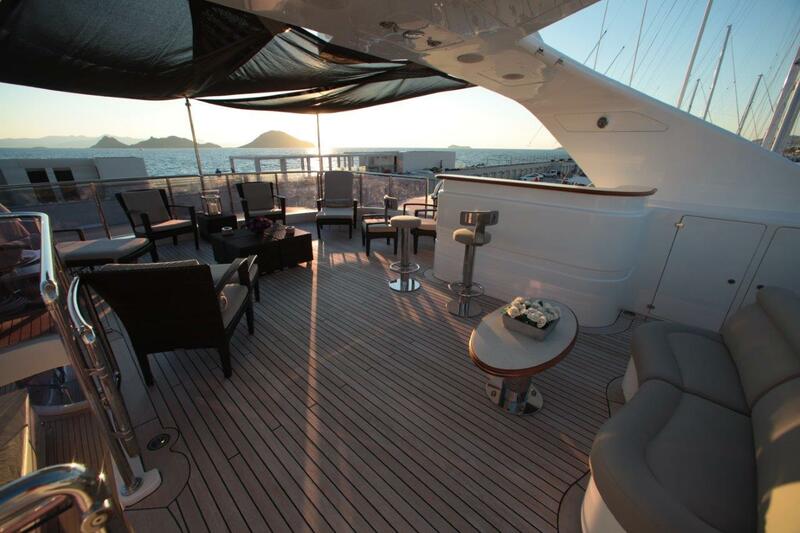 The Benetti Classic motor yacht QUEST R also boats zero-speed stabilizers. 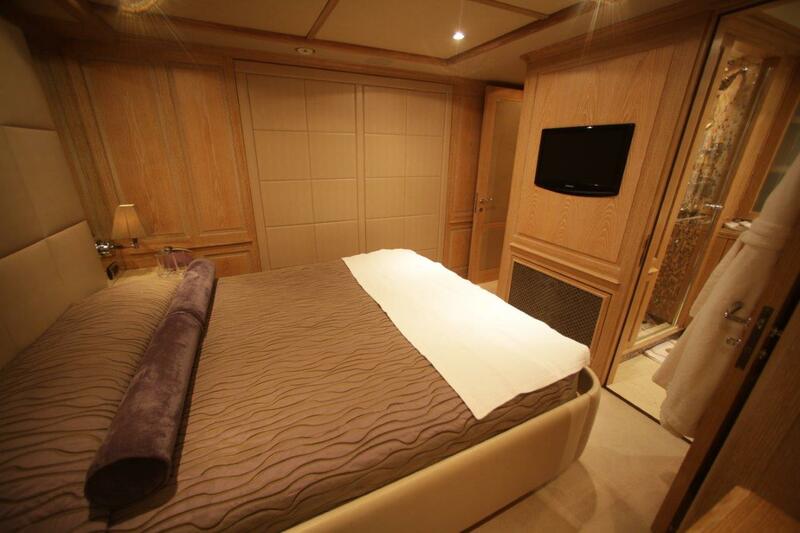 Charter yacht QUEST R can accommodate up to 11 guests in 5 en-suite cabins. 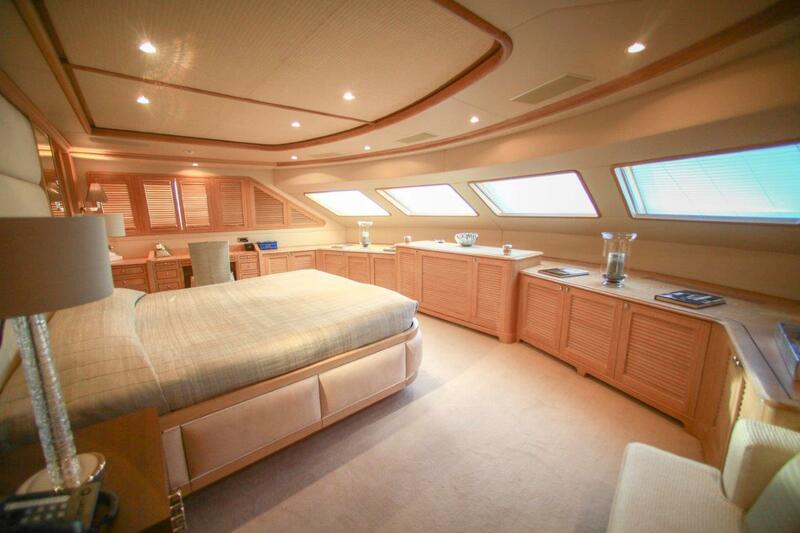 The master cabin is forward on the main deck and full beam of the yacht. 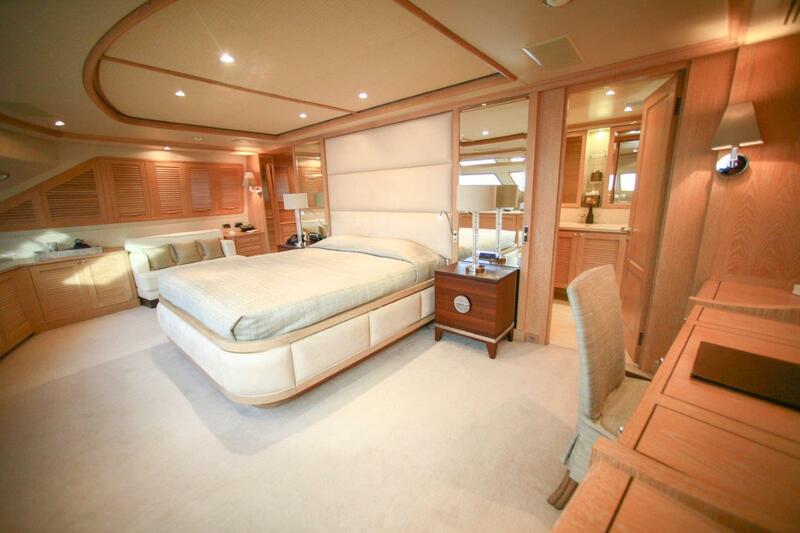 It features a king size bed, vanity, sofa, large en-suite facilities and private study. 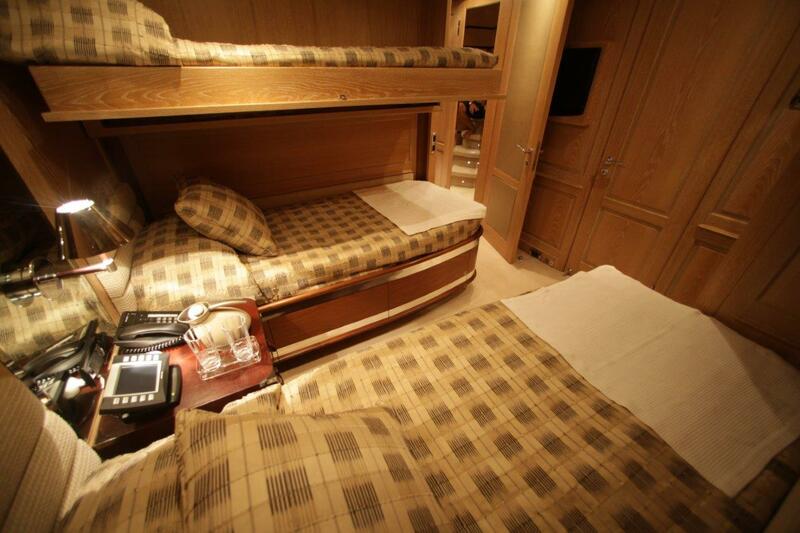 Below decks are 2 VIP cabins, both with king size beds. A further 2 guest cabins offer 2 twin single beds and an additional Pullman berth each. All cabins receive ample natural light and feature entertainment systems. Tenders & Toys available on board the QUEST R motor yacht include a RIB Tender 5.8 with Honda 150 HP, a RIB Tender 5.2 with Honda 50 HP, a Jetski 1 pair of water skis (also usable as mono ski), a junior water ski for kids, a kneeboard Inflatable toys: 1 x crocodile( tow banana 3 people) 1 x doughnut 2 people 1 x towing toy Hurricane (1 Person) 1 x towing toy Big Mable Audio Visual Equipment and Deck Facilities IPOD Docking Station in Every Room TV with Central Movie System & 500+ movies available Daily Newspaper Printout Service Water Mist Air Cooling Spray on all Exterior Decks. Communications V-Sat Internet through LAN & Wireless GSM Altobridge Personal Mobile Service & Charge Back Service.